Dr. John Rettger currently teaches Power Vinyasa and Restorative Yoga classes at YogaWorks in Palo Alto, CA. When he is not teaching traditional yoga classes on the mat, he is the Director of Mindfulness at the Stanford University Early Life Stress & Pediatric Anxiety Program. 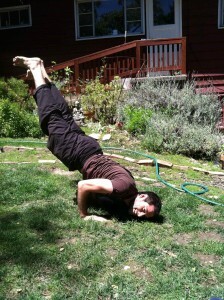 He is a licensed clinical psychologist (PSY27863) in private practice in Palo Alto and a meditation and yoga teacher. He has been teaching mindfulness professionally for six years. John’s training background includes a doctorate in clinical psychology from the Institute of Transpersonal Psychology, a master’s degree in Education from Duquesne University in Pittsburgh, PA and certification as a yoga teacher with specialized training in teaching yoga to youth. He has co-authored scholarly articles on mindfulness and trauma-informed psychotherapy interventions and has published numerous online articles on mindfulness, compassion, psychology, meditation and yoga. His work has been featured on the PBS NewsHour, San Francisco’s KALW Local Public Radio, local online newspapers, yoga blogs and internationally published in Yoga Therapy Ireland. John continues to advance an active research agenda and is passionate about being a lifelong student of mindfulness, yoga, and Existential-Humanistic and Transpersonal Psychology. For those interested in learning more about John’s work as a psychologist, please visit drjohnprettger.com.